Following their earlier showcase of the Mobile TV DH01 at the Mobile World Congress, Motorola unveiled another personal media player, the Mobile TV DH02. 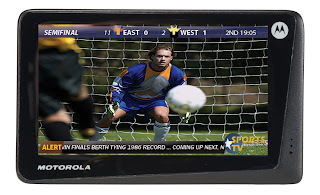 The Motorola Mobile TV DH02 is a mobile TV, PMP, and personal navigation device in one. This device features a touch screen interface plus HSDPA/GPRS. I don't know about Motorola, but if they just include these cool features on their mobile phones then maybe they wouldn't have to bail on their mobile phone unit.